How Does the Environment Affect You? 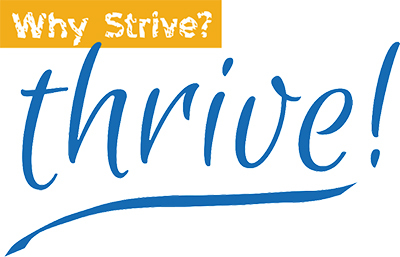 | Why Strive? Thrive! I entered the garden through a metal gate within a gray concrete brick wall. Straight ahead was a walkway and a three-story chorten (stupa) that looked like a large white and gold vase. Instead of flowers, there was a pyramid-like pillar topped by a crescent moon and sun. Each tier was encompassed by a white wrought-iron fence that looked like hand-made lace. To my left were five gigantic gold prayer wheels. At the base of each wheel was a Bhutanese elder, beads in hand, quietly saying prayers, to the tinkling bells. 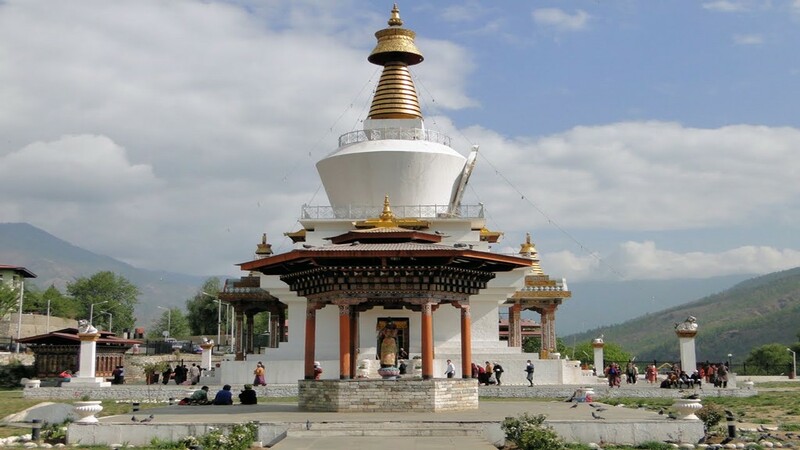 We had come to see the National Memorial Chorten built in honor of the Third Druk Gyalpo (King) of Bhutan located in the center of Thimphu, the capital. While others waited for our guides to begin sharing the history and unique qualities of this chorten, I moved forward to begin my three clockwise circuits around the base. There were a few locals quietly walking with me, but at this time of the morning, most of the residents of Thimphu had already visited the Chorten and moved on to the rest of their day. At the back of the structure I found a bench with a dry corner. I sat down, closed my eyes, felt the warmth of the sun on my face, aligned my spine, and shifted my awareness to my breath. I was feeling irritable and physically wimpy (that’s a medical term). The bug I had picked up in Delhi had just barely begun to respond to the antibiotics, and I really wanted to be in a cozy bed with a cup of tea. The traffic sounds from the streets began to recede and the calls of ravens in the trees behind me seemed to get louder. I was vaguely aware of the sound of footsteps and people chatting as they walked through the grounds. It was amazingly easy to slip into a meditative state amidst the traffic noise of the capital, the bells of prayer wheels, the sounds of other visitors, and the ravens calling to one another. Most of the time I was blissfully unaware of anything other than my breath and the loving kindness meditation I was practicing. I’ve reflected on that meditative experience and numerous others in Bhutan and Nepal since our return to the US. It seemed so easy to slip into that focused-unfocused state, even when my legs would cramp from sitting or while sweat was dripping down my face, and sluicing down my back from the climb to a chorten or temple. Why was it so easy? What made those meditative experiences different? The environment, of course. (I’m famous for stating the merely obvious.) Each structure was built for meditation and contemplation. To my Western eyes the temples were beautiful, confusing, and complex, filled with bright paintings, figures of demons/mythical figures, offerings, and statues of Buddha. Yet, I experienced a sense of deep reverence each time I entered a temple or a chorten garden. It is more difficult to maintain my meditation practice at home. In my home office I have a lovely altar filled with spiritual and heart-tugging artifacts, found objects from nature, and instruments that create sacred sounds. I have a meditation cushion and a comfortable chair. I have music and guided meditation recordings. Each object has a meaning or a memory connected to it. My mother’s beaded necklace, a carved rock, a ceramic figure, an owl, gifts from my sister, former team-mates, and mentor. Buddhist prayer beads, Christian crosses, a statue of Ganesh, a prayer scarf, and Native American totems all contribute to a sense of spirituality, reflection and peace. My desk is littered with files, sticky notes of cryptic sentences, journals, and books. Each reminding me of tasks to be completed, ideas for articles to write, and books that I want to read. Our surroundings have a direct influence on our actions and reactions. Typically, we are unconscious of the powerful impact the environment has on our behavior and mood. Think about it. Are there places in which you feel immediately comfortable and relaxed, environments that are somehow welcoming? Yet other spaces feel uncomfortable as soon as you cross the threshold, like an itch you can’t scratch? Some environments might cause you to feel a sense of awe and peace. We are wired to pay attention to our surroundings, unconsciously. It is a survival instinct and one of the responsibilities of the oldest part of our brain. Savvy retailers rely upon our responses to the environment to draw us into their stores and increase sales. If you want to create a new practice or abolish an undesired habit, you need to consider how the environment helps or hinders your desire for change. Next week I’ll share more about how to effectively use your environment and reduce unconscious reactions. In the meantime, pay attention to the different spaces you enter and how you feel in each one. Where are you the most productive, relaxed, or energetic? Where are you the most distracted, uncomfortable, or fatigued?